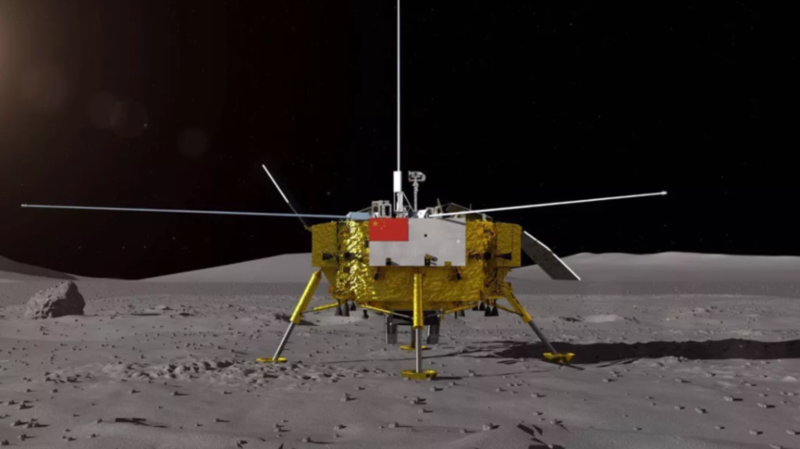 China is all set to attempt the first ever soft-landing on the far side of the Moon, announcing on Wednesday that it will launch the Chang’e-4 lunar lander and rover spacecraft in December. Editor's note: the launch is now expected on December 7. Renders of the lander and rover were unveiled at a press conference in Beijing, along with a contest (Chinese) to name what will be China’s second lunar rover, and a video preview of the mission. A render of the Chang’e-4 lander on the lunar far side. The Chang’e-4 spacecraft has completed payload integration and space environment testing. It will launch in December atop a Long March 3B rocket from the Xichang Satellite Launch Center, in the southwest part of the country—the same site used for China’s five previous lunar-related missions. Chang’e-4 will target the South Pole-Aitken (SPA) basin on the lunar far side. A landing in the SPA basin is one of lunar researchers’ top priorities, because it's the oldest lunar basin and may contain material on its floor that came from the lunar mantle. Being the first-ever landing on the farside, the mission is likely to gain a lot of attention and bring prestige to China’s space program, if all goes according to plan. Chang’e-4 was manufactured at the same time as Chang’e-3, to provide a backup in case of mission failure. Chang’e-3 landed in Mare Imbrium in late 2013 and deployed a little rover named Yutu. Following that success—which was the first lunar soft-landing by any nation since 1976—Chang’e-4 has been repurposed for this new, audacious mission. Because the Moon is tidally locked to the Earth, we never see its far side from the ground. This means the mission requires a relay satellite to facilitate communications between Earth-based ground stations and the spacecraft. The relay satellite, named Queqiao, launched on May 20 and entered orbit around the second Earth-Moon Lagrange point on June 14. According to Wednesday’s press event, the satellite and its 4.2-meter antenna are functioning well and are ready to serve as the ‘bridge’ between the Chang’e-4 and the Earth. You should read Luyuan Xu’s blog on the relay satellite, which also details the secondary science objective of the Netherlands-China Low-Frequency Explorer (NCLE), the folklore origins of the Queqiao satellite, and more. Relay communication link profile between the Chang'e 4 relay satellite Queqiao, the Earth ground station, and the lunar lander and rover. 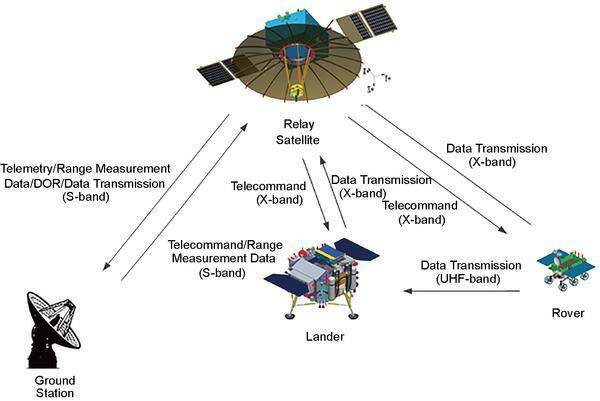 The Chang’e-4 lander looks a lot like Chang’e-3, with the addition of three, 5-meter booms for the Low Frequency Spectrometer (LFS), similar to the NCLE antennae on Queqiao. The lander will also carry a Landing Camera (LCAM), Terrain Camera (TCAM), and the Lunar Lander Neutrons and Dosimetry Experiment (LND) led by the Christian-Albrechts-University in Kiel in Germany (pdf). The rover will carry a Panoramic Camera (PCAM) and Lunar Penetrating Radar (LPR), like those carried by Yutu, which respectively returned incredible images from Mare Imbrium and brought new insights into the lunar subsurface. There are also new instruments: the Visible and Near-Infrared Imaging Spectrometer (VNIS) and the Advanced Small Analyzer for Neutrals (ASAN), which was developed by the Swedish Institute of Space Physics in Kiruna. 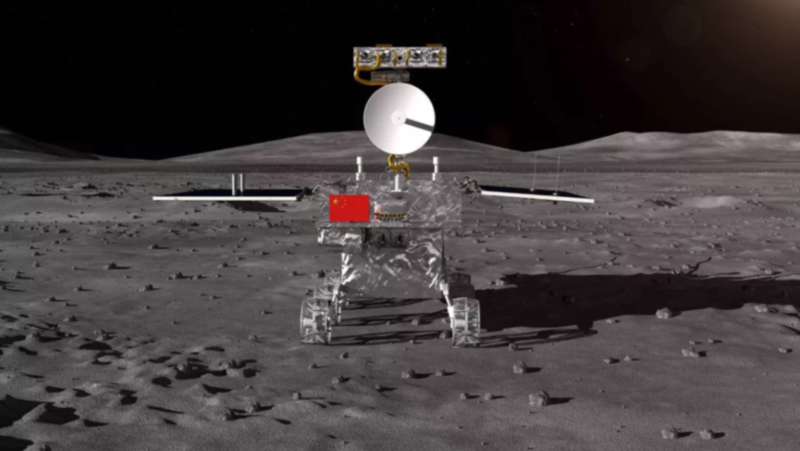 Another difference from Yutu is that the Chang’e-4 rover has no arm and no elemental chemistry instrument. A render of the Yutu-2. A 3-kilogram canister containing a lunar biosphere experiment—which includes potato and Arabidopsis seeds, and silkworm eggs—is also going to be aboard for the trip. The experiment was chosen from a public competition and is led by Chongqing University with the involvement of 27 other Chinese universities. Where, exactly, will Chang’e-4 land? The South Pole-Aitken Basin (SPA) is large—roughly 2,500 kilometers in diameter. A number of teams, including some scientists from outside China, are looking at possible landing areas around Von Kármán crater and the Apollo basin. 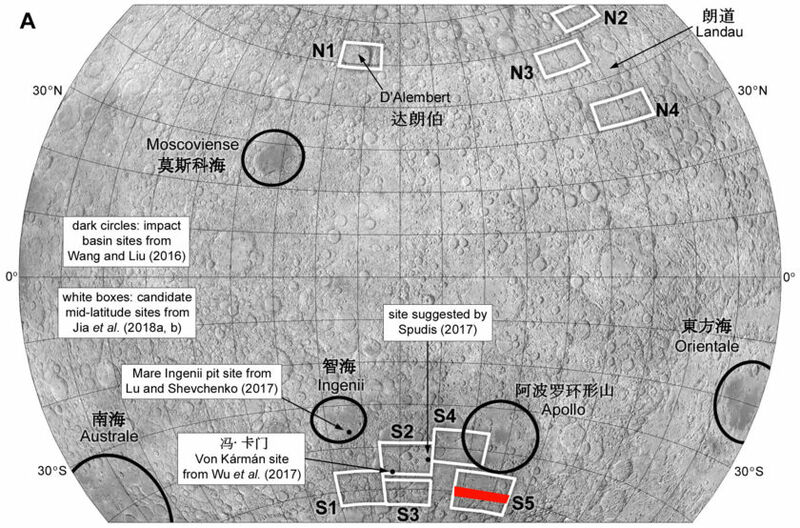 Phil Stooke, who produced a fascinating post on how China decides where to land its upcoming Moon missions, has listed and mapped the areas noted in papers on potential landing sites in the SPA, listed S1 through S5. A map of the lunar far side showing known candidate landing areas for Chang’e-4. The red strip represents the most likely region as of August 2018. The red area indicates coordinates (48.5° S – 51.5° S, 144° W - 162° W) that were given in the Chang’e-4 mission preview video released on Wednesday. However, we cannot be certain that this is the selected final landing area, as an explicit statement on the landing site was not given. 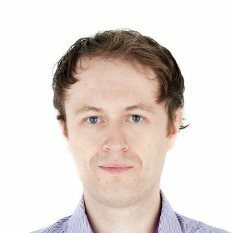 And, as Phil noted in an email, some of the footage in the video is of Saturn’s moon Tethys rather than the Moon, casting a touch of doubt on accuracy of the rendering. So, we may have to wait until closer to launch to find out where exactly Chang’e-4 will attempt to land. Longjiang-2 (aka DSLWP-B), one of two microsatellites launched along with the Queqiao relay satellite in May, is still functioning in an elliptical orbit around the Moon, with amateur radio enthusiasts using the 47-kilogram spacecraft for experiments. Longjiang-2 carries a camera developed by KACST of Saudi Arabia, accounting for the final of four internationally-provided payloads for Chang’e-4, which sent back these cool images of the Earth and Moon. Another onboard imager developed by students at the Harbin Institute of Technology (HIT) in northeast China has allowed radio operators to download images. Here is one such image, of Mare Nubium on the near side of the Moon. 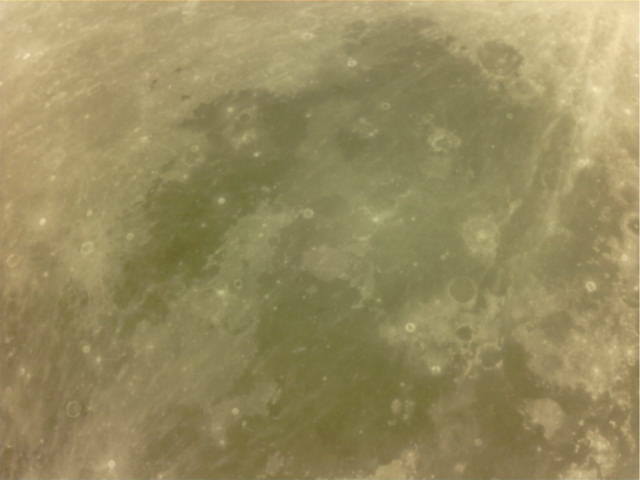 The Moon’s Mare Nubium imaged by the student camera aboard Longjiang-2/DSLWP-B.